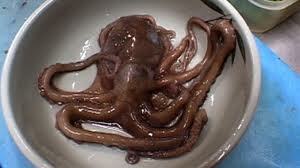 For some reason, my brain immediately thought of the live octopus dish served in South Korea…it’s obviously raw! Fear not, you don’t have to eat these guys if you want to try a raw food diet out. A raw food diet is basically one that consists of foods that are unprocessed and uncooked, although they can be heated up to only 46 degrees Celsius. (some authors will define raw as “vegan foods”, but I wonder if sashimi counts…c’mon, we live in Vancouver, the sushi here is great!). While I’m not quite ready to shift my ENTIRE diet over to raw, I have had the pleasure of sampling some amazingly prepared raw food (lasagne, pizza, mmmm) – I’ve been to Gorilla Food (http://gorillafood.com) in downtown Vancouver and Rawthentic Eatery in Qualicum Beach (http://www.rawthenticeatery.com) and definitely enjoyed their eats….in the summer. Holistic Nutritionist, Cara Roth, has kindly shared one of her favourite recipes that will have you rushing into the kitchen to make, raw food advocate or not. Enjoy! They are super indulgent and trust me no one will have any idea they are super healthy! I like to make my brownies into balls and roll them in shredded, unsweetened coconut – but you can also press them in a 5″ spring form pan or roll them in any topping you like! 3. 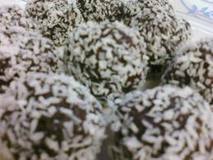 Form into balls, roll in coconut and voila! I love to gift these in a clear treat bag with a red ribbon. I’ve gifted these for pretty much every reason under the sun (and for no reason at all). They are also great to have as a snack on your way home or while making dinner to stave off the “I’m-so-hungry-so-I’ll-just-eat- whatever-I-can-grab-the-fastest” state. Lastly, these babies freeze amazingly well and are great to have on hand any time. Cara moved to Vancouver, BC to pursue a degree in Cell Biology & Genetics at the University of British Columbia. During this time, she dove into another passion of hers- baking – and became a Certified Pastry Chef. She started her education in nutrition by becoming a Certified Raw Food Chef and Sports Nutritionist. Ironically, while attending pastry school she was introduced to Holistic Nutrition and knew this was a big part of her path. She completed her Registered Holistic Nutrition designation with Merit with a vision to spread healthy and scrumptious food to the world.